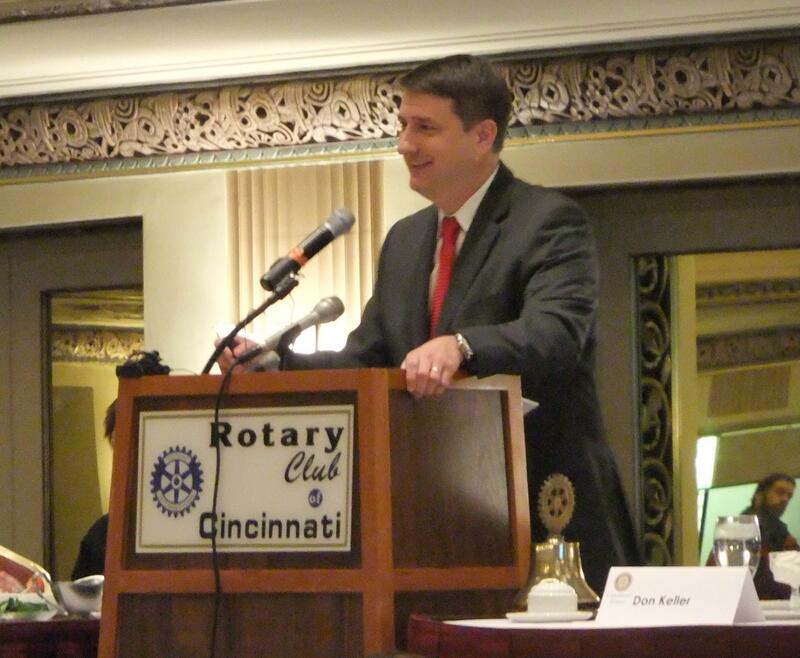 Hamilton County Commission President Chris Monzel delivers the State of the County address at a Cincinnati Rotary Club meeting. Members of the Cincinnati Rotary Club and guests gather for the annual State of the County address. A barbershop quartet serades a pair of Rotarians at the start of the Valentine's day meeting. Hamilton County is "on the move and getting stronger." That was the theme of Commission President Chris Monzel's State of the County address Thursday. Monzel talked about the importance of keeping taxes low and how the Governor's proposed budget could benefit the ailing county stadium fund. He says the county is also focused on infrastructure projects, especially the multi-billion dollar federally mandated sewer system upgrade. One money-saving plan involves ‘daylighting’ a stream to capture storm water rather than building a costly tunnel. “That tunnel by itself could cost anywhere between $500 million and $600 million. But doing this alternative, it’s going to cost us around $240 million; we’re saving over $300 million to rate payers in Hamilton County. It’s these types of ideas that we need to bring forward, to think about, so we’re doing the right project at the right time at the right cost,” he says. While not a core function of county government, Monzel says economic development is another strategic area. He says the county is trying to make it easier for companies to do business here. Last year he created a "red tape cutter" position to help developers quickly navigate the permitting process. The county is also creating an industry advisory committee to make it easier for businesses to locate here. Monzel also hinted that a deal could be nearing completion and ground could be broken soon on a still unnamed hotel at The Banks.